The Castillo de San Marcos is a National Monument constructed in 1672 by Spain. It protected St. Augustine from pirate attacks until the British took over control in 1763. The Spanish received the fort back, however, less than twenty years later as part of the negotiations ending the American Revolution. The second Spanish Period ended in 1821. From 1875 to 1887, Indians from the Great Plains and the Southwest were exiled to Florida and imprisoned in the fort. Geronimo’s wife was one of those captives. Today, vacationers to the Old City can tour the historic fort. Located just near Anastasia Island in downtown St. Augustine, the Castillo de San Marcos is walking distance from The Peace and Plenty Inn. Fort Matanzas is a 1740 Spanish fort that was given National Monument status in 1924. This monument consists of the fort, 100 acres of marsh, and barrier islands all along the Matanzas River on the Atlantic Coast of Florida. The Fort is located just a short drive from the Peace and Plenty Inn. The Matanzas inlet was the scene of several important events in Spanish colonial history. In 1565, the massacre of French soldiers took place, which was Spain’s opening move in establishing a colony in Florida. Spain’s last effort to ward off the British was the construction of Fort Matanzas in 1740-1742. 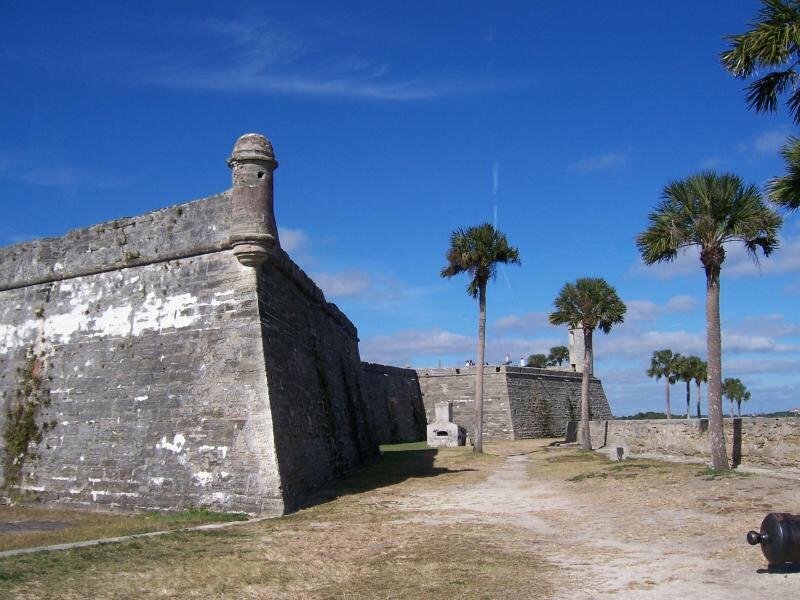 Spain hoped to keep the English from bypassing the Castillo San Marco Fort in St. Augustine. 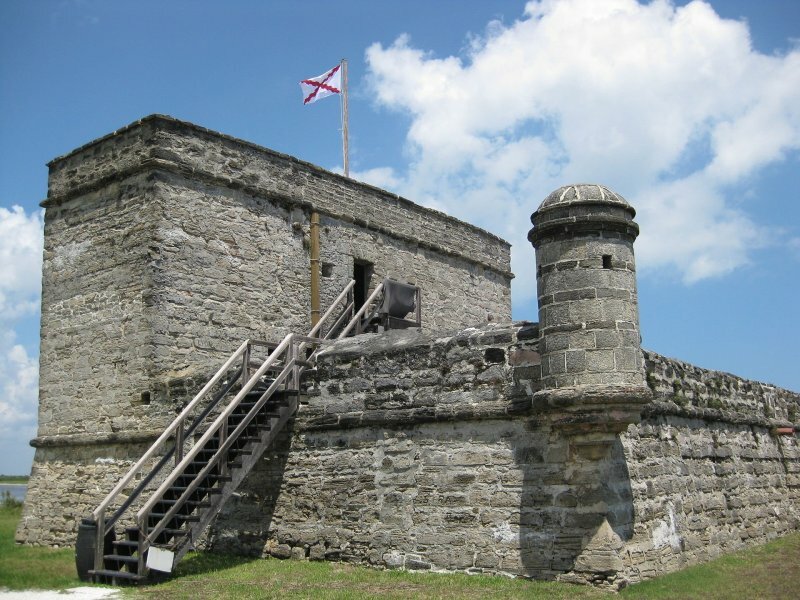 In 1819 the United States took control of Florida, and no longer used this fort. It fell to ruins. Restoration began in 1916 and by 1924 the National Monument status was proclaimed. Under the Park Service, Fort Manatees was placed on the National Register of Historic Places on October 15, 1966. Fort Matanzas is only accessible by guided boat tours. This National Monument in St. Augustine Florida is open every day of the year except for December 25. At the Fort Matanzas National Monument, a ferry service leaves from the dock behind the visitor center every hour at half past the hour between 9:30 am and 4:30 pm. This free guided tour lasts approximately 45-50 minutes. The Fountain of Youth Archeological Park marks the spot where Pedro Melendez came ashore in 1565. He had 700 soldiers and colonists with him to establish St. Augustine. They were greeted by the Timucuan Indians. The first Thanksgiving was celebrated there along with the first Catholic Mass. There is a 200 foot cross on that location. St. Augustine is the oldest City and Catholic Parish in the United States. Stay at the Peace and Plenty Inn and you can enjoy the day visiting this famous spot! Ponce de Leon may also have first came ashore in 1513 searching for the “Fountain of Youth”. At the Fountain of Youth Archeological Park, you can tour the Spring House which is made of natural materials and protects the famous fountain, as well as the historical cross that was believed to have been placed by Ponce de Leon himself to mark the site of his famous landing. Made of coquina stones, the cross, known as the Landmark Cross, sits in the exact location it was found, and the surrounding Spring House was built around the location. Nearby to the cross sits the Salt Cellar, which is an exact replication of a salt cellar that was discovered in 1904 at this historic site. The original cellar was found buried near the cross. When it was unearthed a letter on parchment paper was found describing the events of Ponce de Leon’s landing and placing of the landmark cross at the site. The cellar is believed to be a gift that Christopher Columbus gave to Ponce de Leon to celebrate their monumental 1493 voyage across the Atlantic. The fountain and other famous historic sites are not the only exhibits to enjoy at the Fountain of Youth Archeological Park. The park also has a planetarium attraction which regularly shows short films. Benches and picnic tables are located throughout the park and there is also a gift shop to purchase gifts and other collectables. 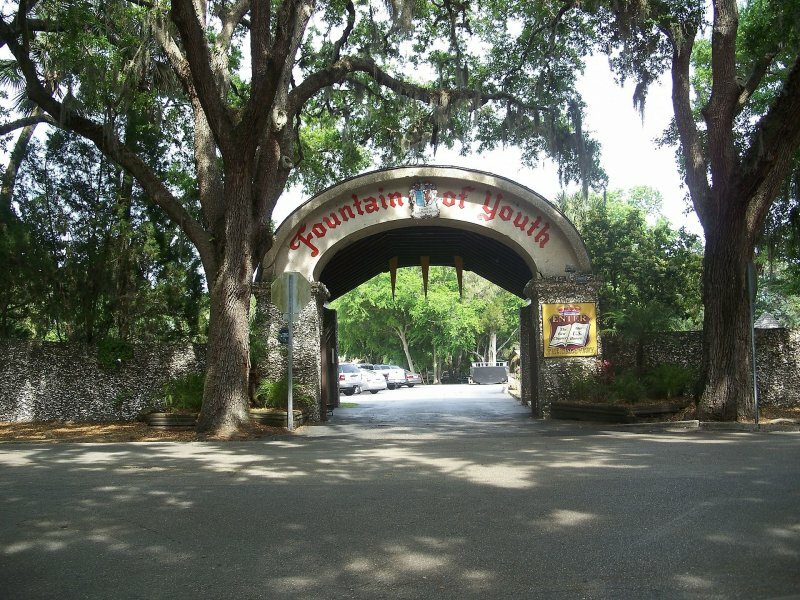 When you spend the day at St. Augustine’s Fountain of Youth Archeological Park you can tour the natural spring and learn more about St. Augustine’s and our nation’s vast history. 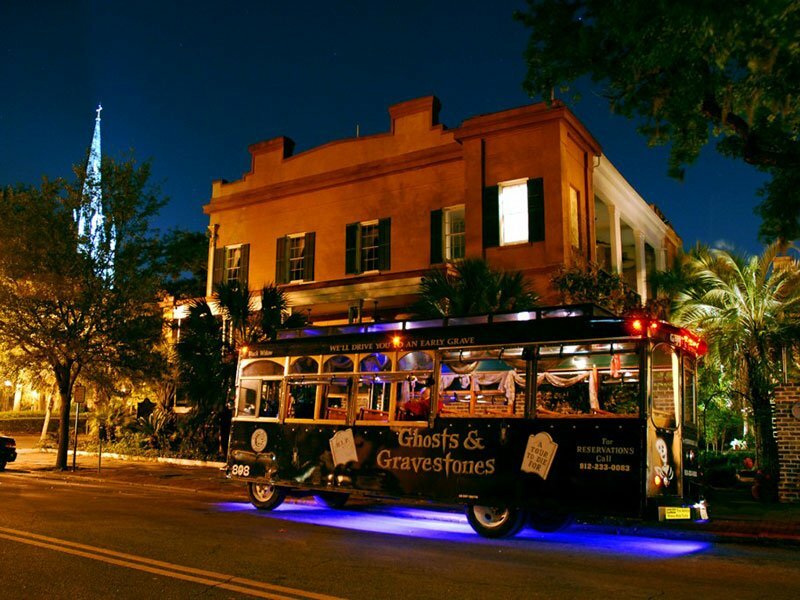 A Ghostly Experience" Walking Tours and “Creepy Crawl” Haunted Pub Tours guides guests in their search for the 450 years of supernatural hauntings of St. Augustine. The tours are led by professional storytellers who impart historical tales researched in libraries, church documents, personal diaries, and interviews. 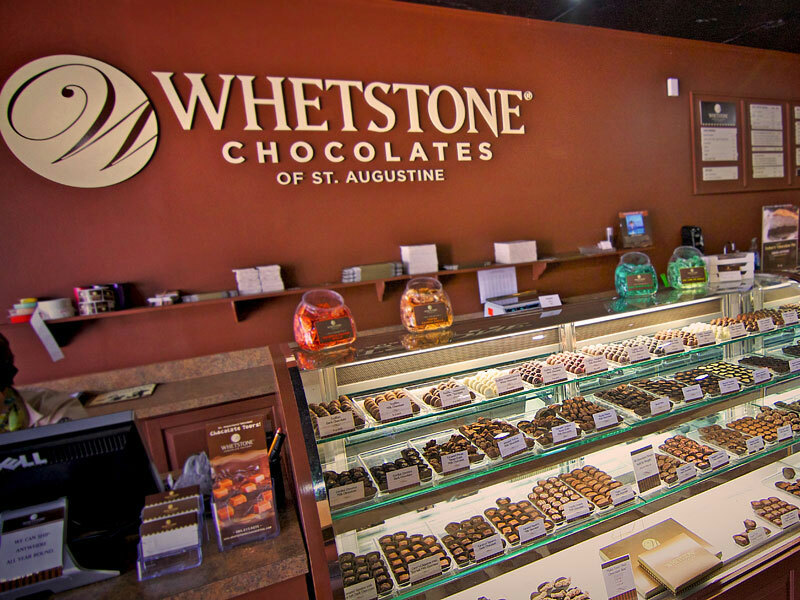 This award-winning tour was recently voted the #1 guided tour in Florida by the readers of Florida Living Magazine, and is featured on the Discovery and Travel Channels. The tour is held every night of the year, including holidays, as well as seasonal and private tours. Lightner Museum is housed in the former Alcazar Hotel built in 1888 by Henry Morrison Flagler (1830-1913). The hotel was often called “the castle of happy returns. In 1946, Chicago Hobby Magazine publisher, Otto C. Lightner purchased the hotel to store his extensive collection of Victoriana. Two years later he opened the Lightner Museum to the public and later donated it to the city of St. Augustine Florida. 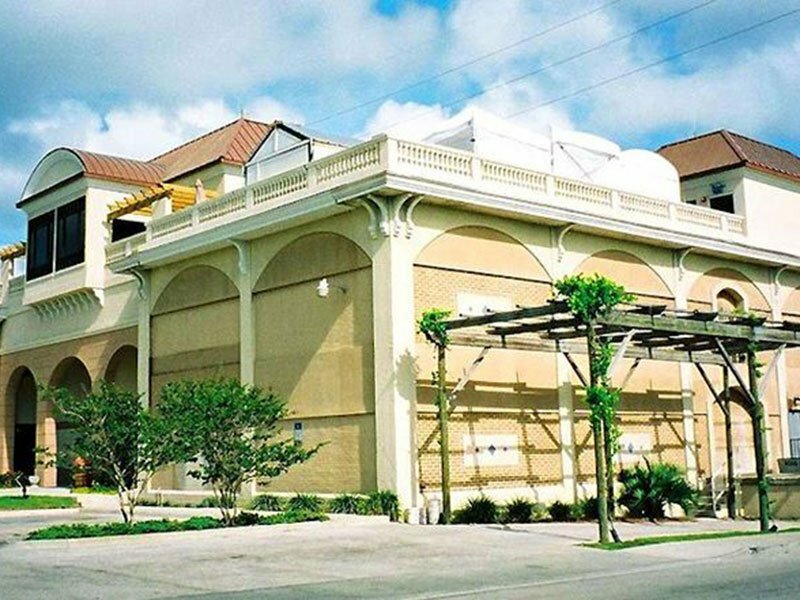 This once hotel is now listed on the National Register of Historic Places. The museum is called the “Smithsonian of the South”. The Peace and Plenty Inn is one block from the Lighter Museum. The building was designed and constructed the P.J. Pauley Jail Building and Manufacturing Company of St. Louis, Missouri in 1891. 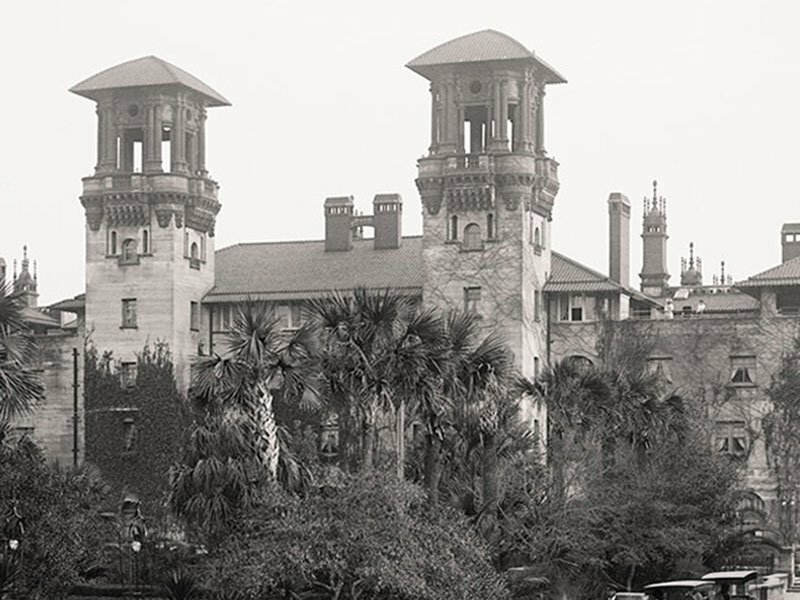 Its construction was financed by Henry Flagler who struck a deal with the county for $10,000 because the former jail building stood on land that Flagler needed for the construction of his Ponce de León Hotel. The Old Jail served as the St Johns County Jail until 1953. Originally built to house up to 72 prisoners, the two story northern wing of the Jail consists of a general population and maximum security area, a women's section and a lower level kitchen. Maximum Security housed the most dangerous prisoners held at the Jail and includes a Death Row cell, for those condemned to die. A total of 8 men were hung from the Gallows on the Jail compound during its history. Overall conditions at the Jail for those serving varying sentences were quite poor by modern standards and prisoners were typically used as free farm laborers during the day. Baths were infrequent, toilet facilities consisted of one bucket per cell and diet was poor and was typically supplemented by any animals that the prisoners might catch while working on the fields. Disease, violence and death were commonplace. The two Story southern wing of the Jail consists of an Office for the Sheriff and living quarters for his family. The Old Jail Museum consists of a restored jail with sheriff's living quarters. It also contains a display of weaponry and a pictorial history of the hangings carried out at the Old Jail, with emphasis on the time the Sheriff CJ Perry was in residence with his family. The Jail is only accessible by guided tour, with costumed guides "processing" in the new prisoners. The Jail also serves as the grand finale to Old Town Trolley's Ghost and Gravestones tour, allowing visitors to access the building by night as well. 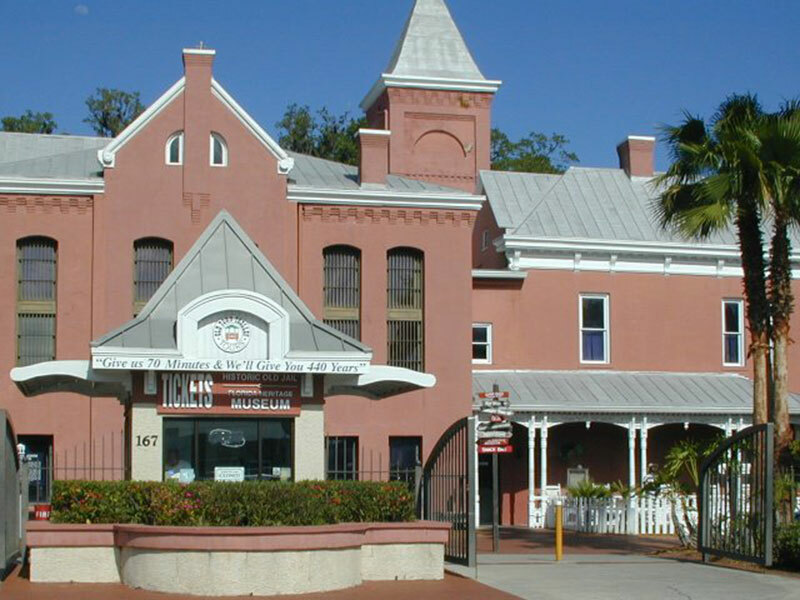 If you like learning about the early explorers to North America and the early inhabitants of St. Augustine while visiting the area on your vacation, check out the Old Jail Museum. Complimentary Winery Tours and Tasting are offered everyday. Upon arrival at San Sebastian Winery you will be taken on an interesting journey through the complete wine making process. After a short audio-visual presentation, there is a guided walking tour of the 18,000 square foot wine production facility. Discover the art of winemaking as you learn the important details of their 5,000 gallon stainless steel tanks where the wine is fermented and stored prior to bottling. After visiting the rustic authentic Barrel Room, where they house their Port, you will be treated to the wine tasting experience. You will be taken through all the exciting steps that they call the five “S’s” of wine tasting, while enjoying San Sebastian Premium Wines. It's fun and educational for the whole family! Children are welcome, however tasting wine is offered to adults of 21 years and over with a valid I.D. Complimentary Tours and Wine Tasting run about every 20-25 minutes, lasting approximately 45 minutes in length and offered seven days a week, (except for major holidays). 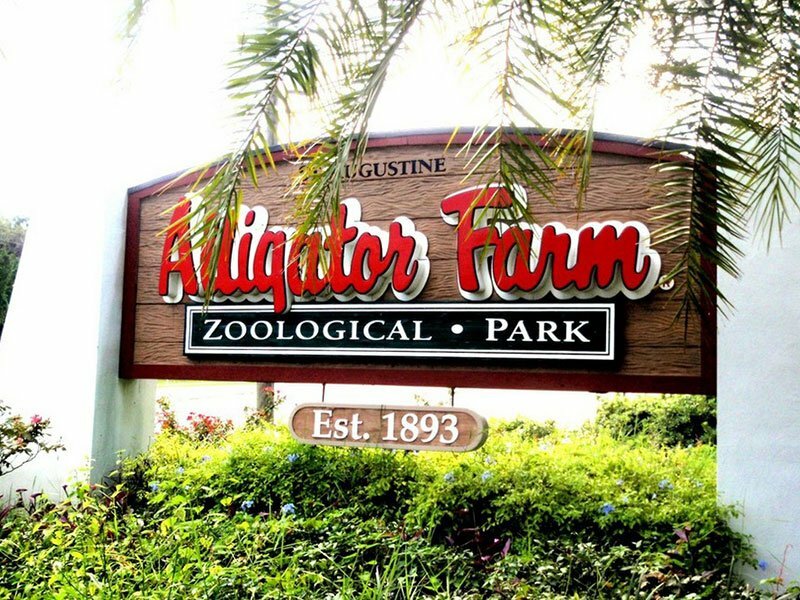 For over 100 years the St. Augustine Alligator Farm and Zoological Park has been entertaining tourists and visitors to the region. Located near Anastasia Island, the zoological park has many alligators, crocodiles, monkeys and several different types of other endangered wildlife including bird and reptile varieties. Book your room now at the Peace and Plenty Inn St. Augustine Bed and Breakfast, which is located in the middle of all of the St. Augustine Attractions and fun things to do on your vacation. The park is perhaps best known as the home of famed, Maximo, a 15-foot, 1250-pound saltwater crocodile from Australia. However, Maximo is not the only exhibit of interest at the St. Augustine Alligator Farm and Zoological Park. Visitors can also view Louisiana albino alligators and the many types of exotic birds found in the Wading Bird Rookery. As part of the parks wildlife conservancy efforts, there are several exotic and endangered species. Don’t miss the chance to see Fiji Island iguanas, Galapagos turtles and endangered macaw. The challenging zip wires over the alligators are the thrill of a life time! 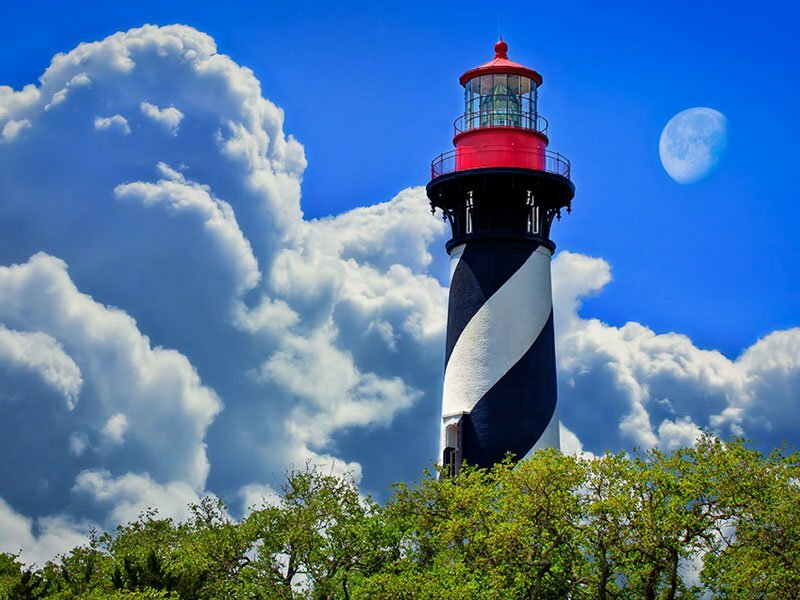 One of the most recognizable St Augustine Florida Attractions is the St. Augustine Lighthouse. This significant structure lies on the northern end of Anastasia Island. A Spanish watchtower, built in the late 1500's was the predecessor of the present St. Augustine Lighthouse. Officially the first light in St. Augustine was lit in an existing coquina structure in May of 1824 by Florida's American territorial government. By 1870, this "Old Spanish Watchtower" as it was known, was threatened by shoreline erosion and the US Congress appropriated $100K for a new tower. Construction began in 1871, and it continued for the next three years. Alabama brick and Philadelphia iron work combined with a new hand-blown, nine-foot-tall, Fresnel lens, from Paris, France. This beacon was installed and lit in October of 1874 by head keeper William Russell and remains one of only a few such operating lenses in the United States. The Peace and Plenty Inn St. Augustine Bed and Breakfast was built in 1894 and experienced the history of the Lighthouse. Stay with us and climb the tower. In addition to the regular St. Augustine Lighthouse tours, the lighthouse also offers a different kind of experience during its night, Dark of the Moon tour. The lighthouse and its buildings have a noted history of paranormal activity as the daughter of one of the old lighthouse keeper's died suddenly in a terrible accident during the construction of the current structure. The lighthouse does close during inclement weather, check with the observation deck at 904-829-0745 if you are unsure. The last ticket to climb the St. Augustine Lighthouse tower is sold at 5:45 pm and the site closes at 6:00 pm. During the month of July and on many popular holidays, the St. Augustine Lighthouse stays open until 7:00 pm, and the last ticket is sold at 6:45 pm. Thanksgiving Day, Christmas Eve and Christmas Day, the St. Augustine Lighthouse is closed. Admiring the Old City’s architecture is one of many great Historical Things to Do in St Augustine FL. One of the most noticeable features about St Augustine Fla is the unique Spanish Colonial and Revival architecture. The Cathedral Basilica St Augustine, is a beautiful example of 18th century architecture and the Diocese itself is very important to the life and culture of St Augustine Fla. 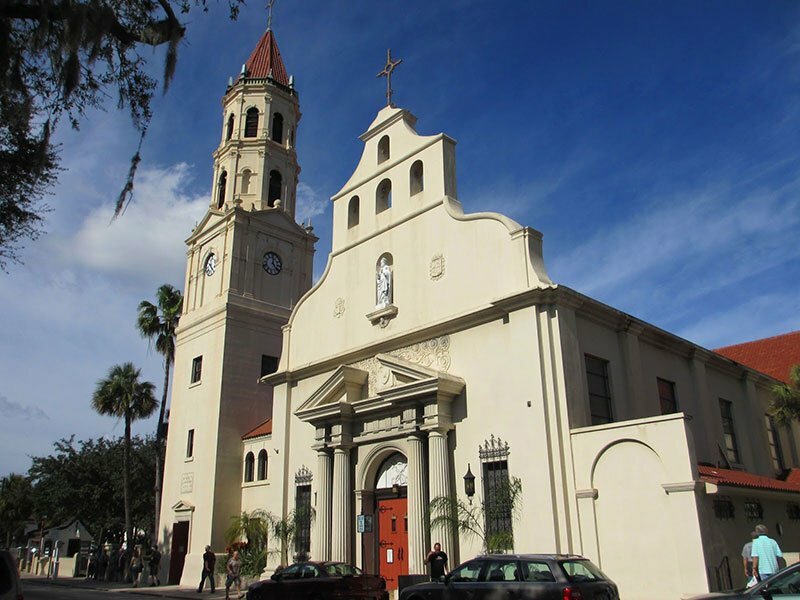 Known today as America’s First Parish, the Cathedral Basilica St Augustine Florida was founded on Sept. 8, 1565. The first structure and two that followed were destroyed by fire and war until finally the current structure was erected. When planning the Cathedral Basilica St Augustine, parishioners sought to build a mission church from nonflammable materials. Since St Augustine had an endless supply of coquina, a sedimentary rock that forms from decomposed seashells, parishioners decided to build the new cathedral using this beautiful stone. The construction took five years (from 1793 to 1797). Its Bell Tower is widely recognized. One of the four bells is believed to have been from the first structure. The Basilica is a National Historical Landmark, and this location is often a favored place to hold a Catholic St Augustine Wedding. The Peace and Plenty Inn St. Augustine Bed and Breakfast is available to accommodate your wedding party. In addition to the beautiful mission cathedral, the Cathedral Basilica St Augustine Florida also houses on its grounds the 204-foot-high "Beacon of Faith" crucifix, Prince of Peace Votive Church, and the Blessed Sacrament Chapel. Tours are limited to 25 people so reservations are suggested. Please call 904.217.0275 now to make yours. The Peace and Plenty Inn is located walking distance to the Chocolate Factory. Although the formal gardens are the centerpiece of this park, Washington Oaks is also famous for the unique shoreline of coquina rock formations that line its Atlantic beach. Nestled between the Atlantic Ocean and the Matanzas River, this property was once owned by a distant relative of President George Washington. The gardens were established by Louise and Owen Young who purchased the land in 1936 and built a winter retirement home. 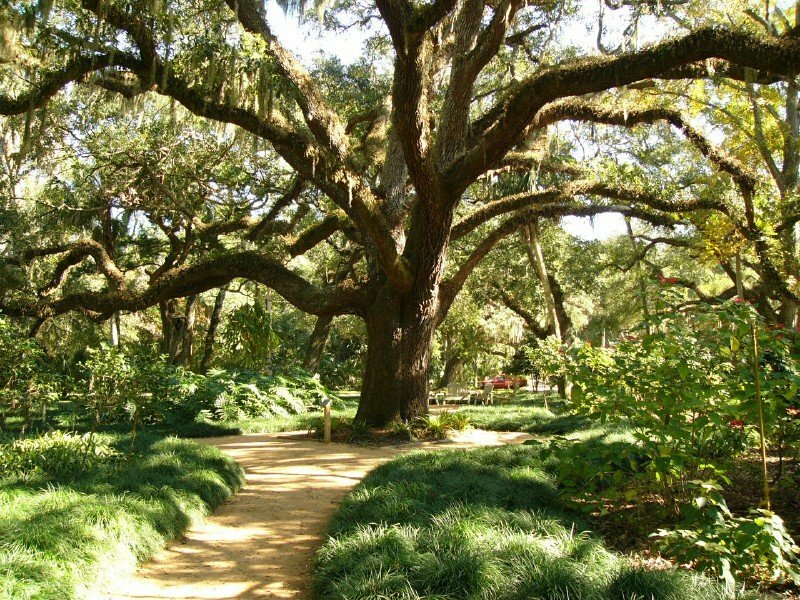 They named it Washington Oaks and, in 1965, donated most of the property to the State of Florida. The gardens make remarkable use of native and exotic species, from azaleas and camellias to the exquisite bird of paradise, sheltered within a picturesque oak hammock. Visitors can picnic and fish from either the beach or the seawall along the Matanzas River. A number of short trails provide opportunities for hiking and bicycling. Visitors can learn about the park's natural and cultural resources in the visitor center. The tranquil garden setting could also be a place to hold Intimate Weddings. Our Bed & Breakfast can accommodate your St Augustine Wedding Party and guest lodging. Plan a picnic here and take part in activities like swimming, shelling, fishing, and hiking. 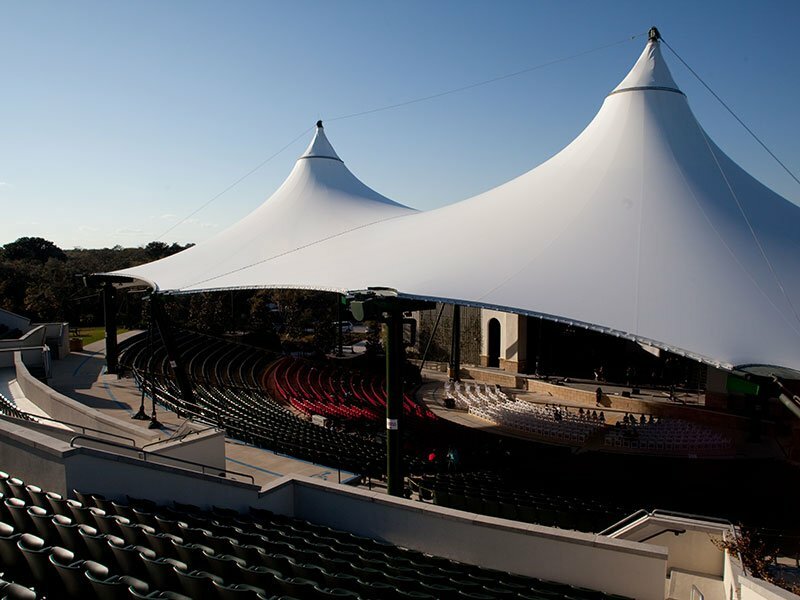 The St. Augustine Amphitheatre is St. Johns County's premier concert and event venue. In conjunction with the St. Johns County Cultural Events Division, the Amphitheatre presents world-class performances throughout the year, including such artists as Aretha Franklin, Bob Dylan, John Legend, Boston, ZZ Top, Jeff Beck, Modest Mouse, Zac Brown Band, John Fogerty, Weezer, Alan Jackson, Imagine Dragons, and Alice in Chains. The St. Augustine Amphitheatre was built in 1965, commemorating St. Augustine's 400th anniversary. It is now run by the St. Johns County Park and Recreation Department, acquired in 2002. Recently the Amphitheatre has undergone an $8.7 million renovation, adding a canopy over the main stage and seating areas, so there's no need to worry about rain. The Amphitheatre seats a total of 3,402 people. There are 91 handicapped-accessible seats, 2,427 seats under the canopy and an additional 975 seats in the grandstands that are not covered. The Ampitheatre is just minutes away from the Peace and Plenty Inn.